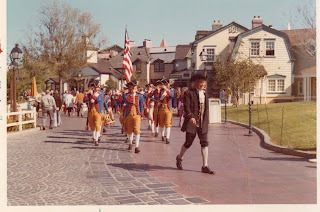 Welcome back to part three of my series on the Magic Kingdom 40 years later. Today we are going to hang a left and go into Liberty Square. One thing that quickly pops out when looking at the old photo and the new photo is the degree of development they have added on the right side. They have taken out the grass and put in a sitting and stroller parking area for the Haunted Mansion attraction. The trees have been allowed to grow and grow they have. It also appears that they have removed a lot of the pavers that were in front of where the steamboat now docks. You can see approximately where the grass was with the light colored path to the right in the new picture. You can see the Liberty Tavern clearly in the original picture (building on the right), but with the trees have grown in and hide it a bit more. Also, the peak of the old Fantasy Faire tent is just showing over the buildings of Liberty Square, unusual since Disney goes to great length normally to hide the each area from view. The tent is now gone, but we will get to that later. The last big change The minutemen no longer parade in this area. 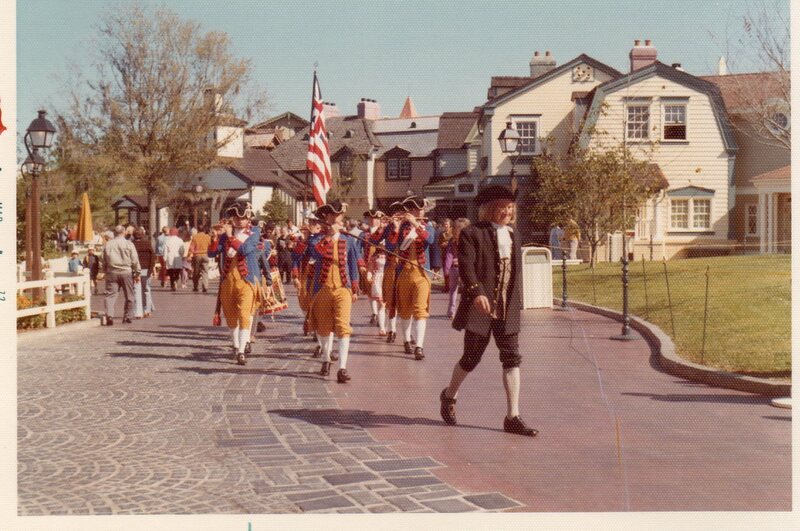 To see them you now have to go to Epcot and visit the America pavilion. Now lets take a look at part of a classic, and one of the original, attractions at Magic Kingdom... the Haunted Mansion. This is one of our favorite rides and with the updated technology the hitchhiking ghosts are much more interactive then they were previously. But that is not the subject of our photo. 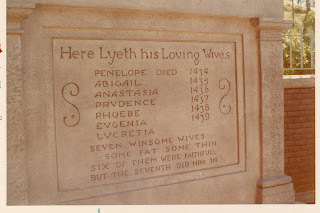 Our photo is all about the gravestone for Blackbeard's wives. Located after you exit the attraction building but well back before the exit from the area, you can walk up the exit to get to the gravestone, but where is the fun in that? The amazing part about this picture is that although there is a bit more weathering, there isn't a lot of change on the "stone". But then this IS Disney and that would be the point. One interesting note was that the bushes finally grew in behind the wall and shaded this place nicely.